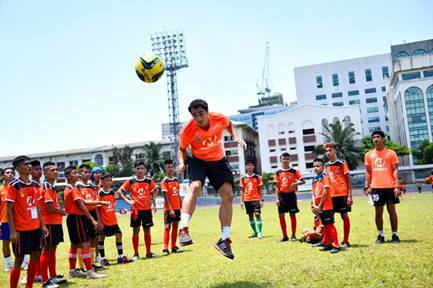 Loyola Meralco Sparks Football Club (LMSFC) Midfielder & Team Captain James Younghusband samples off a heading drill to children participating in the Football for Peace 2016 Football Clinic held at the University of Makati Track & Oval Field last April 26. 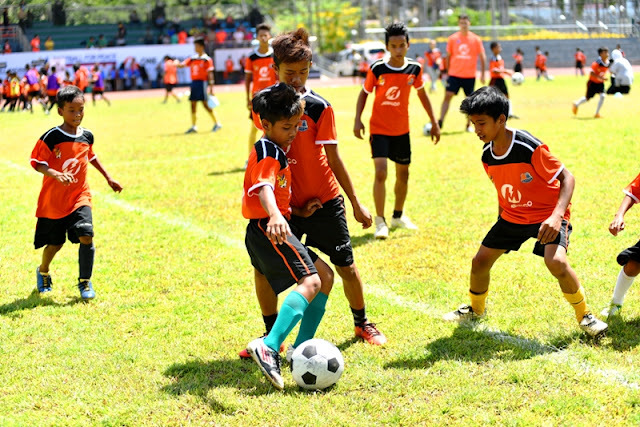 MAKATI CITY -- More than 200 children mostly from conflict areas in Mindanao participated in a football clinic held Tuesday, April 26, at the University of Makati Football Stadium. 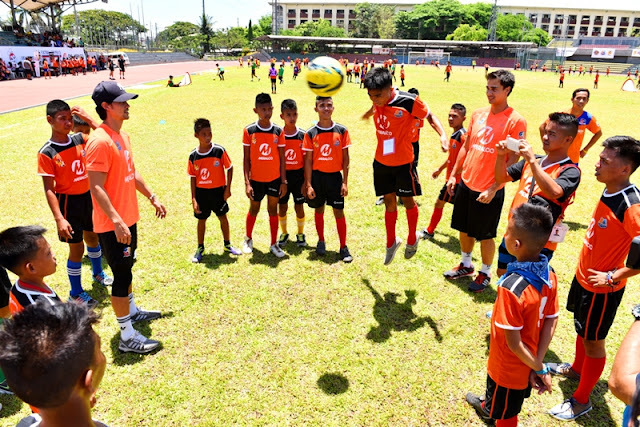 The “Football for Peace” clinic is an initiative of One Meralco Foundation (OMF), the social development arm of Meralco, in partnership with the Philippine Marine Corps (PMC), and is part of the annual “Football for Peace Festival” which runs from April 23 to May 1 this year. Meralco’s UFL football team, the Loyola Meralco Sparks football club, facilitated the half-day training alongside volunteers from the Meralco Football Club composed of Meralco employees. Each year, the festival brings hundreds of children from various provinces in the ARMM and other areas where the Philippine Marines and Philippine Army are stationed to Metro Manila to learn football and compete with various football clubs here. Started in Sulu by the Philippine Marines in 2011, the Football for Peace advocacy utilizes football as a tool to instill peace-loving values of sportsmanship, camaraderie, teamwork and discipline in the minds of young athletes, especially those who have been exposed to the armed conflict in Mindanao. This year’s participants come from Sulu, Basilan, Sultan Kudarat, Misamis Oriental, Zamboanga del Sur, Zamboanga City and Palawan. Apart from football, the kids will embark on an educational tour which includes a visit to science museums, manufacturing plants, educational institutions, historical landmarks, media outlets, among others. Phil and James Younghusband of the Loyola Meralco Sparks FC look on as a participant of the Football for Peace 2016 Football Clinic applies the techniques he learned from his mentors. On the last day of the festival, the kids will be grouped into teams and will compete with various football clubs from Metro Manila and other provinces in Luzon. The exhibition games will take place at the football field of the Philippine Marine Corps general headquarters in Fort Bonifacio, Taguig City. “It is a great honor for us to be chosen by the Philippine Marine Corps as their partner in this inspiring initiative. We have been supporting ‘Football for Peace’ since 2012 and we are committed to sustaining this valuable cause. Our shared belief of building the skills of our young people to become responsible, productive and peace-loving citizens will hopefully lead us to a better country. 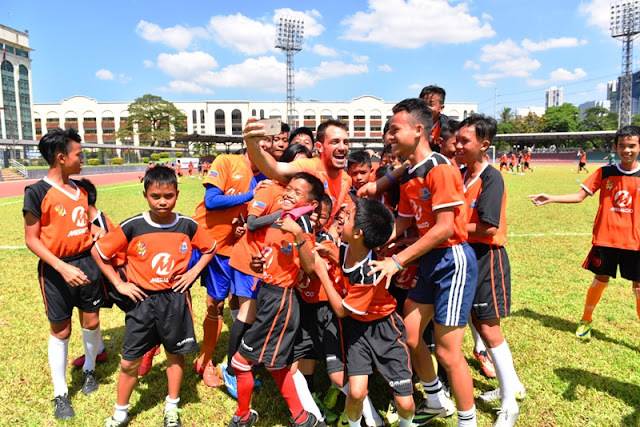 OMF's participation in the Football for Peace program is a concrete expression of our commitment to youth development through sports,” said One Meralco President Jeffrey O. Tarayao. “Football for Peace” began one afternoon in 2011. Lt Col Stephen L Cabanlet and his fellow members of the Philippine Marine Corps stationed in Sulu decided to play football in a field just outside of their detachment. Intrigued by the “new sport,” the local children gathered around them to observe. After a while, the soldiers took a break and intentionally left the ball on the field. But when they returned, they saw the children playing with the ball, imitating the way they played the game. The children were so ecstatic that the soldiers couldn’t retrieve their ball. And then an idea popped out from the mind of Lt Col Cabanlet. If a simple round ball could capture the interest of these young people, then maybe the same could lead them away from the armed conflict and instead, aspire for a better life. “Football for Peace” was born. Lt Col Cabanlet and his comrades began teaching football to their eager “students” almost every day since, but they made sure to set certain conditions before the children are allowed to play. Beginning with one small team, the soldiers managed to expand the training and organized inter-barangay tournaments. Then other marine detachments from nearby provinces joined in with their own teams which competed with those in Sulu. To formally launch “Football for Peace,” a one-day peace cup was held in Luuk, Sulu in December 2011. Children participants of the Football for Peace 2016 Football Clinic share lighter moments with children from other regions and some Loyola Meralco Sparks team members. Inspired by the advocacy of Lt Col Cabanlet and his peers, the Foundation began supporting “Football for Peace” starting with the donation of 500 balls in 2012. In the following years, the Philippine Marines brought the festival to Manila to give the participants a different kind of experience and show them how peace can pave the way for progress. The Foundation, for its part, sponsored a football clinic lead by the Loyola Meralco Sparks Football Club and the Meralco Football Club. Children participants of the Football for Peace 2016 Football Clinic get to practice the moves they learned from the Loyola Meralco Sparks team members. Coach Simon McMenemy and the Sparks team flew to the province to train not only the kids but also their civilian and military ‘coaches.’ Most of the local coaches did not have formal training in the sport and so, giving them a crash course proved to be beneficial especially to their students. OMF also donated much needed training equipment to the coaches. PMC, OMF and the Sparks are laying out plans for another football clinic outside of Metro Manila this year. Jollibee and Delimondo, team sponsors of the Loyola Meralco Sparks, supported the advocacy by providing food and refreshments to the participants and trainers.